During his career, Dominic has worked with clients such as: Centex Homes, CTX Mortgage, Landmark Homes, 1st Premiere Mortgage, AG Edwards, Alere Medical, CHSI Nevada, The CFO Group, Ameriwest Financial, North American Title, Andregg Geomatics, Manhard Consulting, HDR Engineering, State Farm, Gizmo Wireless, The Corner Doc, First American Title Company, Stewart Title Company, GI Consultants, The Hilton Foundation, Hartford, PC Doctor and more. What is extremely encouraging about the relocation of Basin Street Properties to Reno is that this is Downtown Reno’s largest private investor in commercial office space. Their relocation gives merit to the belief in our region’s quality of life and the factual benefits of doing business in Nevada; not to mention that it will add jobs and have a positive economic impact on the region. To read an article with more information about the Basin Street Properties relocation to Reno, please click here. Reno’s Downtown office submarket is slowly but surely benefiting from the “makeover” taking place. The revitalization projects over the past five years have transformed downtown and the trend continues. New and redeveloped condo complexes, coupled with street beautification projects and the Reno Aces AAA baseball stadium & event center truly make downtown a desirable place to live, work and play. This all spells good news for the downtown office market, although competition with other Northern Nevada submarkets for the relatively limited demand will likely remain tough through 2010. In the 2nd quarter of 2009, Class A downtown office vacancy increased to 18.7% from 16.49% compared to the same period the year before. This is largely due to overall market conditions; office vacancy rates in every northern Nevada submarket increased over 2008 levels and are at or near their highest levels since official records have been kept. The biggest news for downtown in 2009 is the Reno Aces Baseball Stadium, which has revitalized the east side of downtown, known as the Freight House District, and has breathed new life into one of Reno’s largest office buildings, 300 E. 2nd Street. Basin Street Properties, with a touch of luck and talent, put 300 E. 2nd Street, also known as the Park Center Tower; into contract prior to the Baseball Stadium development was announced. Now proud owner and soon to be tenant, Basin Street Properties is relocating their corporate headquarters from Petaluma, Ca to Downtown Reno. Both Basin Street and baseball fans alike have benefited from the eleven floors of parking this fifteen story office building provides. The building has undergone significant redevelopment and more is planned with ground floor retail scheduled to open as early as Q4 2009. While the new baseball stadium seems to steal most of the headlines regarding downtown redevelopment, let’s not forget some other notable office redevelopment projects in the Downtown submarket. Despite market conditions, AMH Properties continues to gain ground in this 32,000 square foot two building redevelopment project. After acquiring this nearly vacant office complex in 2007, AMH Properties completely updated the interior, exterior and landscaping with new energy efficient, contemporary designs. The complex is now home to a number of new tenants such as Understand.com, The Laughton Company, Gaston & Wilkerson and more. The next in line for an AMH Properties’ redevelopment is this two story office building which is currently being converted into a mixed use project with ground floor retail and 2nd floor office. Cathexes Design recently turned this dated 20,000 square foot office/warehouse into a new vibrant multi-tenant office building. An artistic design coupled with green building construction makes this a truly unique downtown redevelopment. Dermody Ventures LLC is in the process of redeveloping this former multi-tenant office and once downtown grocery store into a mixed use Retail/Office complex. The building is surrounded by the heavily traveled S. Virginia Street, Sierra Street and California Avenue. The building has great visibility and one of the highest parking ratios downtown. MTK, LTD. recently completed this centrally located mixed use project on the corner of State Street and S. Virginia St. This Class A development is in the heart of Reno’s financial district sitting neighbor to Reno’s Pioneer Center for the Performing Arts. State Street Plaza consists of ground floor retail and 2nd floor office. The aforementioned projects have driven the insipid reputation of the CBD into an energetic downtown. 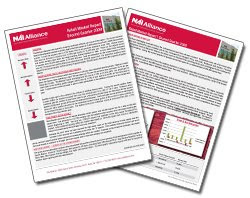 Yes, statistics show an increase in office vacancy, but with a hint of new construction and sprawl of the national economy, a two point increase depicts a healthy performance when compared to the double digit increases in alternative submarkets. As once characterized as the “rubber band” effect, tenants and citizens alike are realizing, once again, the convenience, amenities and diversity Downtown Reno bestows. Aaron West-Guillen has 15 years of land acquisition, entitlement and development experience in northern Nevada. 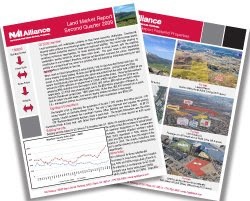 The Q2 Land Report is now available for download. During his career, Scott has worked with clients such as: Barnes & Noble, GM, Merck Pharmaceutical, Henry Schein, Home Depot and Ahold to facilitate their real estate needs. Even though it seems like forever ago given the downtrodden economy, only a short time ago, Landlords didn’t pursue personal guarantees nearly as aggressively as they do now. I certainly don’t blame them in trying to protect their investment and having some sort of collateral in place in the event of default, but it’s pretty tricky in trying to determine who’s financially viable in today’s marketplace. It’s also very difficult on the tenant representation side to recommend to a client that they financially obligate themselves beyond the business level and expose their personal assets. Are there ways around this issue or is there a happy ground that can be met between Landlord and Tenant? Absolutely. One simple suggestion is to seek a “termed” personal guarantee, whereby the personal guarantee is eradicated after a set period of time of faithful performance of the lease obligations. Though at times it becomes a necessity to successfully complete a transaction, if you’re a tenant and are out looking for space or are preparing to sign a lease, seek a professional and look for alternative options before signing a personal guarantee. Scott joined NAI Alliance in March 2008 to assist the company with investment sales. Previously, Beggs spent over seven years with Dermody Properties as Vice President of Acquisitions and Port Management. I fully acknowledge that prices have come down considerably from the 2005-2007 period. I would also contend that some very high quality assets with little risk continue to trade at what most would consider very low cap rates (on our market in the 7% to 8.0% range). The argument that I continue to try and counter is the one that I hear from folks who say ALL real estate will or should trade north of a 10% cap rate. Based on what? Buyers would like sellers to believe that, but this is just not reality. Will some deals get done at 10%, 11%, 12% or event 13% cap rates, absolutely. Will ALL deals get priced at that high of a cap rate. No. And oh by the way, if buyers want to achieve excess returns (and I would argue that double digit initial yields should be considered “excess returns”), they had better be offering with ALL CASH, relatively short due diligence periods, and a demonstrated ability to close. Motivated sellers will in fact have to part with certain assets at very high cap rates (low prices) due to ill-conceived capital structures. But the winners of those deals will be the groups that can demonstrate their ability to close with little uncertainty to the seller. The seller will sacrifice pricing for execution, to the extent they can. But sellers are not going provide highly attractive pricing AND accept the risk that a buyer will be able to get a 70% LTV loan over and extended due diligence period. And while it is definitely a buyer’s market, there are and will continue to be a lot of very well qualified and motivated buyers when the pricing get enticing. To think that there are not a lot of other well capitalized buyers out in the market looking for these same good deals is myopic. Regardless of the environment, buyers do not have an open playing field. There is something new coming to downtown Reno and it is the State Street Plaza office and retail center located next to the Pioneer Center for Performing Arts. The developers of this office and retail center, MTK Limited, will be hosting the chance for you to see what downtown Reno has to offer. When: July 7, 2009. Where: 170 S. Virginia Street, State Street Plaza. Please RSVP to dbrunetti@NAIAlliance.com.